I had a friend staying last night and she needed an early lift to the station so I got up early to take her. The light in the house was quite odd and at first I thought it was my eyes but then I was very pleased when I looked out and saw a thick fog. I stopped on the way home and wandered into town and back through the colleges. it's been a creative day in fact - I made a felted version of @lucypics' dog Saski, collected some prints from an 18 year old film and now I'm about to start on the sleeves of the jumper I'm knitting. What a fantastic scene and composition! I love the fog and how you captured the couple right in the center. The link didn't work? I'd love to see that as well. You are on a ROLL! You go girl! Gorgeous shot. Foggy and freezing this morning on school walk here.... sun out now for afternoon pick up. @moreyoulessme The link is just to Lucy's project (which is lovely but sadly she doesn't post often) - I will put a pic of the felt version up at the weekend. That is amazing, and would love to have that on my wall. DOUBLE FAV. 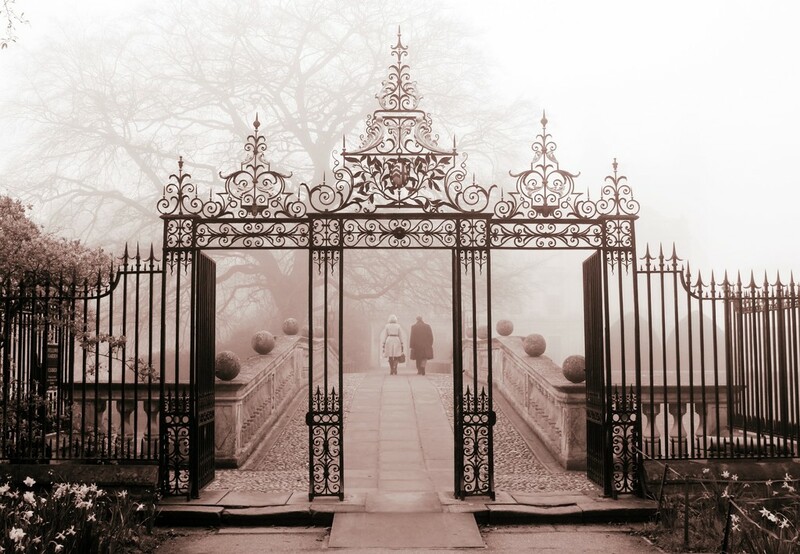 Fabulous, love the mood and atmosphere and those gates frame the couple perfectly. That does sound like a creative day. This is a beautiful photograph which shows off the gate to it's maximum. The backdrop of the tree is perfect. So lovely. very moody and atmospheric with the mist and the placement of the people makes it a fabulous composition. I'm with @newbank , told you how good this was! Congrats on TT! @newbank @Cherrill Aargh!!! Thank you ladies!!! Haven't been TT in a long time! Might have to pull my finger out & take some photos! what a wonderful capture... congrats on TT! this is gorgeous Judith.. its motivating me to get out in winter to find fog!! Wow -- this is fantastic!! So good to see it on TT -- add another fav from me.